Cor Zonneveld introduces an alternative to the traditional paper to assess whether students meet an important learning outcome. He invites students to show their learning through formats such as blogs, board games, poems, drawings, raps or any other creative product. This free format stimulated the motivation of students enormously and led to products of superb quality. In this talk he shares his experiences, and discusses the desirability of diversifying assessments with the audience. Many learning environments and didactic methods for teaching and learning inter- and transdisciplinarity have been developed and implemented. Less attention has been paid to the assessment of the learning outcomes. 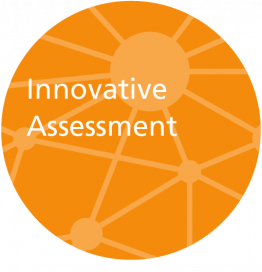 An assessment tool that explicates what students are expected to learn could enhance student learning from inter- and transdisciplinary work. During this talk, we will introduce an assessment rubric based on the ‘boundary crossing’ theory. The rubric operationalises the four learning mechanisms of boundary crossing, i.e. identification, coordination, reflection and transformation into assessment criteria and respective levels of performance.